Be the first to share your favorite memory, photo or story of George. This memorial page is dedicated for family, friends and future generations to celebrate the life of their loved one. 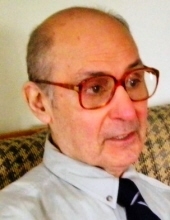 George Keros, 87, formerly of Bloomfield Hills, passed away in Naperville, IL, on January 24, 2019. George was born and raised in Detroit, where his parents, Vasili and Anastasia, settled after emigrating from the Peloponnesus in Greece. Throughout his youth, George worked at his father’s restaurant, the Lafayette Coney Island. With the outbreak of World War II, business was booming, and George was promoted to night manager at the age of 10 while attending school. After graduating from Thomas M. Cooley High School in 1949, George enrolled at the University of Michigan, Ann Arbor, where he majored in business administration and played on the football and baseball teams. In 1952 his studies were interrupted by the Korean War. George was assigned to the 3rd Infantry Division, 65th Mechanized Infantry, Heavy Tank. He fought in active combat for a year and a half, receiving two Bronze Stars for valor. He stayed on to provide humanitarian assistance to devastated rural communities in Korea and Japan before returning home. From an early age, George exhibited his father’s entrepreneurial spirit. His interests were broad: from astrophysics, history, and nineteenth-century literature to classical and big band music, state-of-the-art technologies, and international affairs. He applied his love of science and technology to capital ventures, immersing himself in the kind of innovative activities that would distinguish his business life thereafter. Following the war, George traveled the country for years, developing the production capacity for a product that would soon be known as particle board. He provided the seed funding for the development of a new technology called microfiche, helping to negotiate the sale of this technology to Bell and Howell. Later, he funded advanced scientific research in the Ann Arbor area, fostering the development of synthetic crystals for laser-guided munitions, X-ray calibration machines, fire-detection systems for army battle tanks, and integration software for the U.S. Navy and the Social Security Administration. He also partnered with the inventor of deep space communications to use satellites for oil exploration, taking advantage of their distance from the earth to scan much larger areas of the planet’s surface in search of hydrocarbon reserves. A film he helped finance and distribute, “Mondo Cane,” was nominated for an Oscar, a Grammy, and the Palme d’Or at the 1962 Cannes Film Festival. In the early 1960s, he met his future wife, Mary. George and Mary were married in January 1963 and moved to New York City. The following year the couple returned to Michigan, moving to Grosse Pointe Shores and then back to Detroit before eventually settling in Bloomfield Hills, where they raised five children. Upon his father’s death in late 1970, George took over the Lafayette Coney Island and worked to raise even further the standards of quality and service established by his father. He developed the proprietary chili and hot dog recipes that would define the Lafayette Coney Island. George operated the business until 1991, when he transferred ownership of the restaurant to its employees. While running the Lafayette, George continued to pursue the diverse business interests that had become his passion. During a three-month residency in Tehran, George introduced surgical lasers to the medical establishment after a personal meeting with the Shah of Iran. He also sold fiber optic cable to the Saudi government for use in domestic communications. Building on his interest in international affairs, George became active in the London-based International Institute for Strategic Studies, raising funds for the organization and attending its annual meetings around the world. An avid traveler, he brought his family on intercontinental trips spanning Siberia and Eurasia, the Amazon, Europe, the Orient, and Antarctica. He and his wife also enjoyed hosting distinguished scientists, academics, and other overseas visitors in their home. In 1985 George and his family moved from Bloomfield Hills to Hopkinton, NH, a small village near the state capital of Concord. He later opened an office in Concord, where he continued developing his business ventures. George valued supporting the locally owned shops and restaurants on Main Street, and he became known for frequenting them and getting to know their owners and employees. In 2017 he moved to Naperville, IL, about an hour outside of Chicago, to be with his daughter Leslie. A loving, dedicated husband and father, George was predeceased by his wife, Mary; his daughter Serena Mary; and his brother Anthony. Survivors include his brother John; his sons Steven and William; his daughters Leslie and Sandra; and five grandchildren. Friends may visit Lynch & Sons Funeral Home, 1368 N. Crooks Road (between 14-15 Mile Rds.) Clawson, on Friday, February 1, 3-8pm. A Funeral Service will take place at St. George Greek Orthodox Church, 43816 Woodward Avenue, Bloomfield Hills, Saturday, February 2 at 11:30am. Friends may visit at church beginning at 11am. Burial with military honors will take place in Hopkinton, NH, in the spring. Memorials may be made to Alternatives for Girls, 903 W. Grand Boulevard, Detroit, Michigan 48208, alternativesforgirls.org or Capuchin Soup Kitchen, Development Office, 1820 Mount Elliott Street, Detroit, Michigan 48207, cskdetroit.org. "Email Address" would like to share the life celebration of George W. Keros. Click on the "link" to go to share a favorite memory or leave a condolence message for the family.